Now that it’s super nice outside, I’ve been trying to spend a little bit of time every week in the front yard, tending to the set-up I call a garden. Last summer was much more about trying to get the backyard in order, so not much happened out here aside from maintenance and a couple new plantings. That means that this is Year 3 for most of this stuff, and I feel like I’m finally getting a better sense of what I want with this space! Which, of course, isn’t really what I have. These things take a long time! Getting to know your plants, your soil, your light conditions, how different plants look together…it’s a long process. But it’s fun to see things grow bigger and bigger as the years go by, and I think most of it will tolerate being moved when the timing is right for both me and the plants. Anyway! I’m not winning any landscape design awards (YET) but I’m still kind of like a proud little kid walking around the garden. I know what everything is, I remember planting it, I cared for it (slightly, let’s be honest)…I love that feeling in early spring when things start to pop up out of the ground and I really love when stuff flowers. It’s all very satisfying. 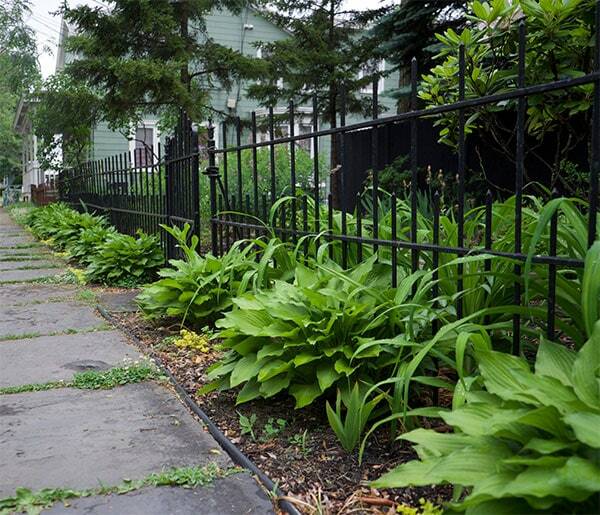 I had this idea last year (inspired by a nearby house I love) to change up this border between my sidewalk and my fence, which I think I still want to do. The hostas are perfect here because they die off in the winter (an evergreen would probably die from getting buried in shoveled snow) and are hearty enough to deal with the pedestrian foot traffic on my street and my lazy watering schedule, wherein I don’t water anything, basically ever. Anyway, the idea is to split these plants and add some more (probably the ones remaining inside the fence), so it reads as more of a single hedge of hosta instead of having big spaces between them like they are now. I aimed to tackle it last fall, which didn’t happen, so now I’m aiming for this fall! My experience with hostas is that you can kind of move and split them anytime and they’ll be fine, but they’d look sad and wilty all summer if I did it now. 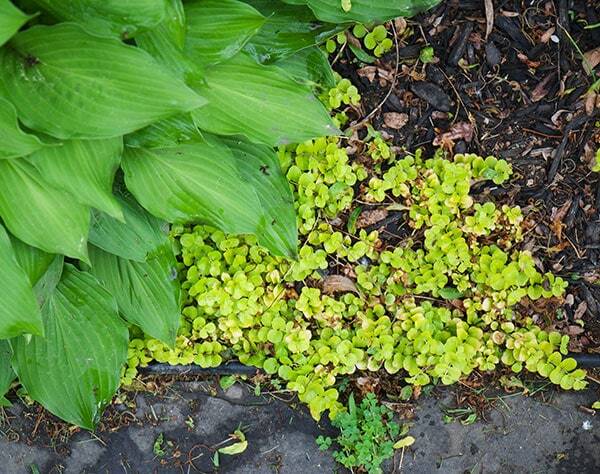 The creeping jenny planted intermittently between the hostas does OK! I think it’s finally starting to creep? I got a lot of comments about planting creeping jenny that it would totally take over and destroy my gardening dreams, but that’s definitely not been the case with any of mine! Definitely bigger than when I planted it originally, but nothing crazy. I’ll probably transport a lot of it elsewhere in the front and into the back when I do the whole hosta hedge project. 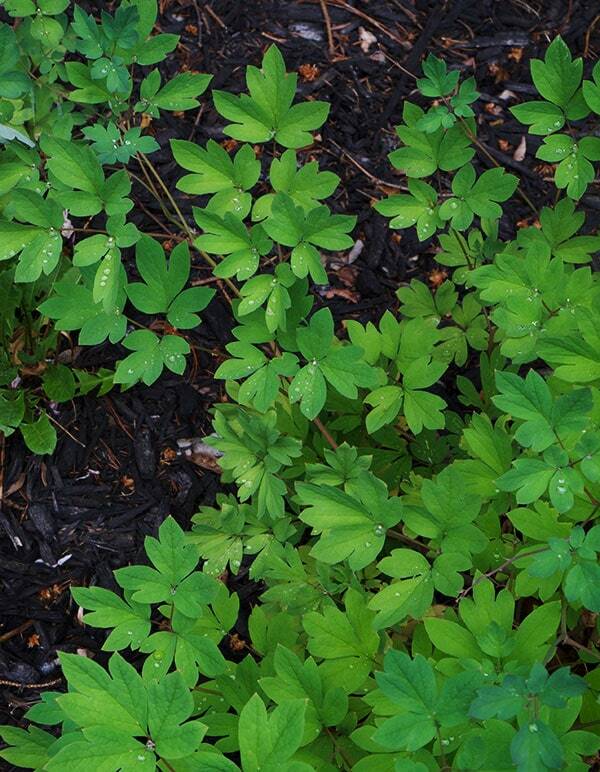 The bleeding hearts have come and gone, but the foliage is still nice for now! I’ll have to cut it down in a few weeks…it’s really just an early spring plant here, but quickly withers and dies when it gets too hot. I snagged a couple of oak leaf hydrangeas last year (reader recommendation!) that are in the process of reemerging! Not sure if I can expect them to flower this year or not, but I like the weird foliage. Ahhhh, my false indigo! I looooove these. The foliage is such a nice color, the plant has an unusual shape, and the flowers are so sweet while they last. After the flowers are done, it’ll grow these bean pods that’ll stay on until the fall. PEONIES! THEY WILL FLOWER! I don’t think these have ever bloomed before, so I’m pretty stoked. 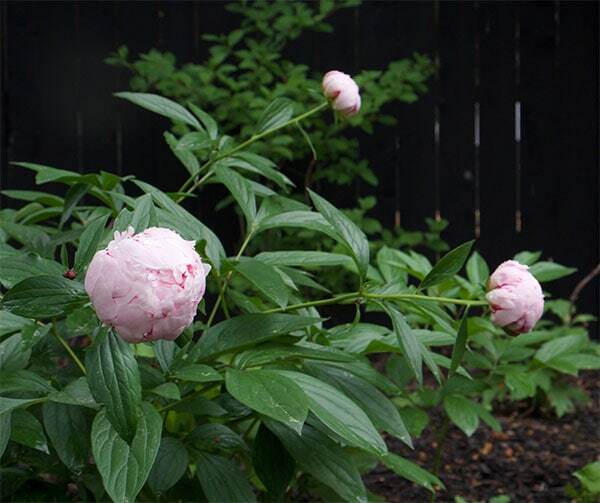 There are three peony plants in the yard, but the other two are teensy and will probably take a couple more years to catch up. 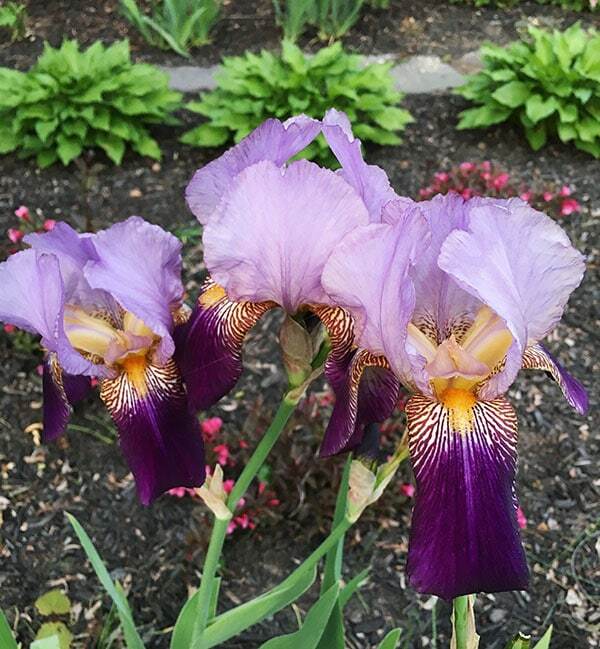 My irises had their best blooms to date this spring! There are a lot of them so this was all very pretty for a few weeks. These irises were planted near the garage when I bought the house and I transplanted them up here, and they’ve really taken off. Good going, irises! I don’t think I ever really blogged about it (whoops!) and it doesn’t look very good in a wide angle, but I did finally plant out the other side of the front yard last summer! Now I want to move everything around there, too, but at least it’s nearly all living (I seem to have lost one small hydrangea and another small creeping juniper) and doing well. This is some type of weigela that I bought last year after it was done blooming, so I never saw the flowers! They’re so cute! And there are so many of them! I have a different type of weigela on the other side of the yard that has more purple-y leaves and more hot pink flowers, but I think that one is a little more of a ground cover and this one stands more upright. Cute! Creeping juniper is unchanged since last year, but I think these are slow-growers and will take a while to lose that fresh-outta-the-pot shape. That’s ok, though—I got time! 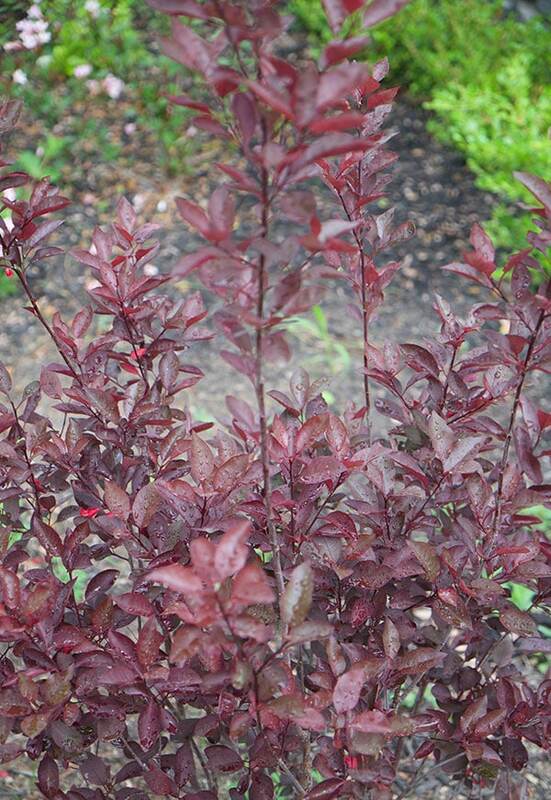 I also planted a purple sandcherry up near the front corner of the yard, which is doing great! I actually didn’t realize they flowered in very early spring so that was a nice surprise. Now it’s just foliage from here on out. They’re super hearty plants and I like mixing in this color foliage among all the various shades of green. That smoke bush is in its third summer and I LOVE it! Some of my favorite foliage. You can see the smoke bush on the far left in this photo, by the bay window. It hasn’t EXPLODED with growth but it does steadily get bigger every year. It’s not planted as close to the house as it appears in photos, so I think the location is fine. But the real focus of this photo is TREES! Last summer I dug all the sod out of this “hellstrip” on the side and planted 3 flowering cleveland pear trees (no fruit). This was based on the one old photo I have of my house, where there were three mature trees here that looked so nice. Pear trees are fast growers, so they’re already much taller and fuller than they were last year. They didn’t flower this spring and I don’t think they will, but maybe in the next year or two or three they’ll get there. Even at this size, they make this stretch of the street SO much nicer, and even make the side of my house more bearable. I’m hoping, PRAYING, PLANNING, SCHEMING to redo this side of the house this summer, which will be SO EXCITING if it happens! Right now it’s a vinyl-clad mess of architectural weirdness that has taken some serious hits over the years, and my goal is to bring it back to how I think it looked when it was built. I can’t wait! It’s not stuff that can be totally DIY’d so I have dibs on Edwin and Edgar for a month or so after Olivebridge wraps up. Grow big and tall and strong, tree! Go go go! And back on the other side of the yard…the ancient rhododendrons that cause me too much emotional distress. These are planted right in front of my porch and I’m not a huge fan, mainly because they’re too tall for the space, and too leggy to be particularly attractive most of the time. Every year I debate removing them, and then every year they flower and I’m charmed by them. They seem to have just finished blooming, which I guess is the time to prune them, so I lopped off some of the really tall branches in an effort to get them to grow lower and fuller. I think I’ll see how this strategic pruning works out over the next couple of years and if I’m not happy with the results, I’ll replace them. They’re probably too established to be successfully transplanted, but I’m sure I’ll try anyway if it comes to that. Who can say! It’s all a process. Does this get you in the gardening mood? I hope so, because next on the docket is my Lowe’s Spring Makeover which—spoiler!—I love! Tune in to see a postage-stamp yard of a D.C. rowhouse go from garbage dump to a chill garden-growing, hang-out having, barbecue-cooking party zone of a space! Yay! It looks, simply put, amazing. Oh, your place looks SO much better than when you first got it!!! Very classy now. You’re going to make property values go up. On learning what works with your soil and climate, we took many walks around our village, sometimes expressly to see what was planted and how it was faring. Our village does a good job of plantings in public areas, like around the couple of parking lots, and along a couple of the streets. There are some funky little garden squares in the middle of some cul-de-sacs in the subdivisions. Obviously, the town maintenance people want something that will look good and not require much work. Gardening is not my favorite thing, so we went for perennials that would take off and flower a lot without much water (hot and dry here) or maintenance. Gotta love that oleander. Hey stranger….long time no blog..but always a treat to have a new email pop up…Garden looks great. I know what you mean by walking around and remembering when you planted something etc…it’s really satisfying. My Dad was a pro gardener so we grew up in many different places but always had the best garden in the neighbourhood. What about a veggie garden..anything happening there…some tomatoes or anything…take care Kingston boy! This is gonna sound stage 4 creepy and I swear I have never been inspired by ANY blog in my gardening, but aside from the oak leaf hydrangea (mine was a different species, until I ripped it out) and the juniper, I have the exact same friggin’ plants. Maybe you’re my secret baby brother from a western province. love this update! would love to see some overview photos if possible! having seen all the befores… its always amazing to see a garden several years later. (but if you dont want to due to security issues, then i understand). i agree about learning what works over the years – my secret wee garden is ten years old this year (WTF?) looking thru my photos (and i have uh tons). 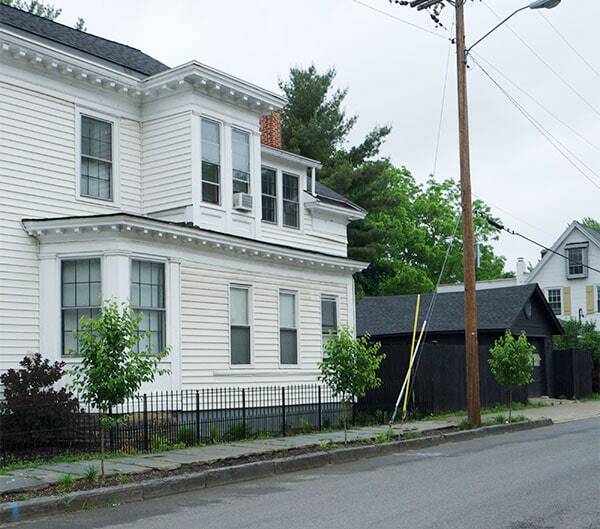 its amazing to see the changes – and i rent so i am not even doing half of what i would have done if i owned. Everything looks good! Do you have much that flowers in the summer time? My hydrangea bush finally(!) bloomed in it’s third year and I have been super excited about it. I have an iris bed to dig up as it hasn’t been thinned out in probably 20+ years, which should be fun. I’m kind of going flower crazy in the front of my house because it’s south facing full sun. 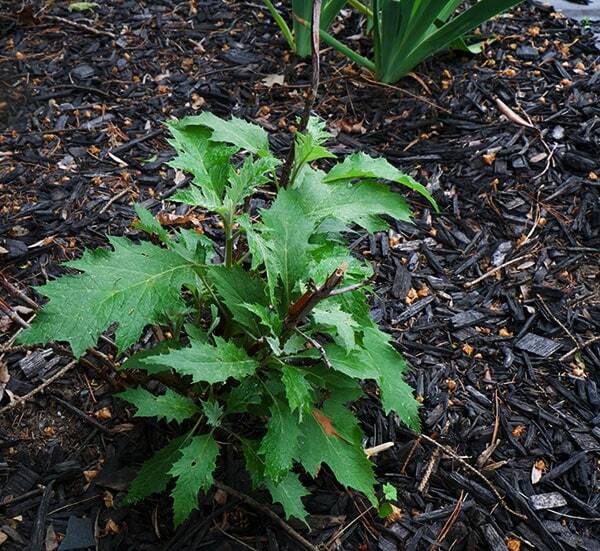 I haven’t figured everything out for one half of it, but I’m trying to plant a lot of bird and bee friendly plants–I want some coneflowers for my garden. I try to plant milkweed for the monarchs too but it hasn’t done so well this year. Have you ever visited Kevin Lee Jacobs’ blog at A Garden for the House? He reminds me of an older version of you, when you have finished all the restoration work on your house and can focus on your garden and recipes :) I think he lives in the Hudson Valley too? It’s been my experience with our rhododendrons that if you do nothing to them, they come back fuller than if you prune them. There were four at four separate houses on our block. Everyone else pruned and mulched. I ignored ours except to pile up leaves under them during the winter. Ours were the only ones that grew and thrived. My mother in law had a similar experience. Just a thought to share. I know there are real people out there who know about these things. You be rolling, and it looks good! I love seeing how your garden has thrived. I moved in March, from an apartment to a terraced house (row house?) and for the first time in years I have a garden to think about, at the back of the house. Okay, so it’s only postage stamp size but it has small flower beds, shrubs, a lot of plant pots and containers (though I don’t know what’s in them) and, thankfully, no grass to deal with. There is a large wooden garden seat/bench which needs attention. So far, the only thing I’ve done is cut back a large hedge, thus letting more light into the kitchen. I love lilac and am wondering if I can fit in a dwarf lilac bush, in a container. You can see why I’m looking forward to your next post. In the meantime, I need to go buy some gardening books. Great to get a glimpse of the old house, she’s looking fine! Based on a gardener friend’s advice, I split my hostas this spring and they did look wilty, but truly only for a day or two, just as my friend predicted. I think you can split them now and they will bounce back very quickly. 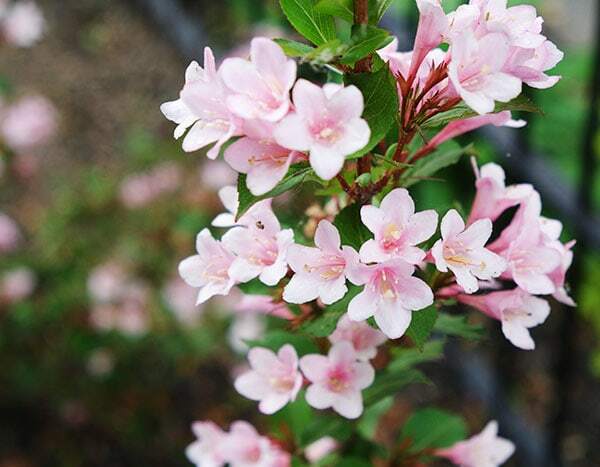 About your rhodo – they have quite shallow root systems so can be easily dug up and moved. Years ago I bought 4 mature rhodo plants off craigslist with very little root, planted them at my house and they took to their new location no problem. I also have a friend who dug up all their rhodos, stuck them in the back corner of their yard while they tore down and rebuilt their house and then replanted them. So if you decide not to keep it where it currently is you could consider moving it. You’re alive! I was beginning to think Olivebridge consumed your soul entirely. Haha. Your yard/gardens look beautiful. There is something deeply satisfying about planting something and patiently waiting for it to grow and blossom and bloom. We have oak leaf hydrangeas in our yard and they are a knockout when they bloom, so just wait! And lastly, not sure if they work in your growing zone, but if you need a lush, climbing plant, I love the clematis we have in our yard. They bloom in big, star-like flowers and create great vertical interest in the garden. It’s all good, except… The Cleveland pears may give you and others a lot of trouble. Have they flowered yet? The ones our town planted smell like rotted fish! They are prone to split in ice storms and are now becoming invasive. I would consider removing them and replacing them with redbud or yellowwood trees. And my wife divides hosta anytime – anyplace and they seem to love it. The deer also love them, so the hosta now live in pots on our deck. Your aren’t kidding. There are Bradford Pears all over center city Philadelphia and they smell terrible every spring. These gorgeous flowers are a pretty post–wonderful change after Olivebridge!! Your yard looks so nice. Everything looks great. I had 4 huge Rhodes on the side of my house here in Oregon. Huge as in taller than the house. We pruned them back hard. Almost down to the ground…probably 2 ft high. They all came back beautifully!!! Now they are thick with gorgeous blooms and I keep them at a reasonable height. Good luck. Yes! I grew up in WA and I witnessed my parents cut many rhodies within a few feet of the ground and they all came back full and lush! Sometimes it takes a couple of years for them to look great again but it’s good to get the height down and add fullness. On the subject of creeping plants the old adage is “the first year they sleep, second year they creep, their year they leap.” I’m sure that creeping jenny will get going soon! The yard looks lovely! Beautiful! Nice work on your planting. My spring garden has been rough, pests are destroying everything and regular spraying with neem oil and soap makes no difference. I’ve been in despair. So enjoy your lovely thriving plants because you must be doing something right. …but I am DYING to hear about “House”/Olivebridge! Hope we get an update on that soon. Smoke bush! I never knew what it was called ’til just this minute, but there’s one that I drive by every day that is ENORMOUS and wonderful. I hope yours thrives! 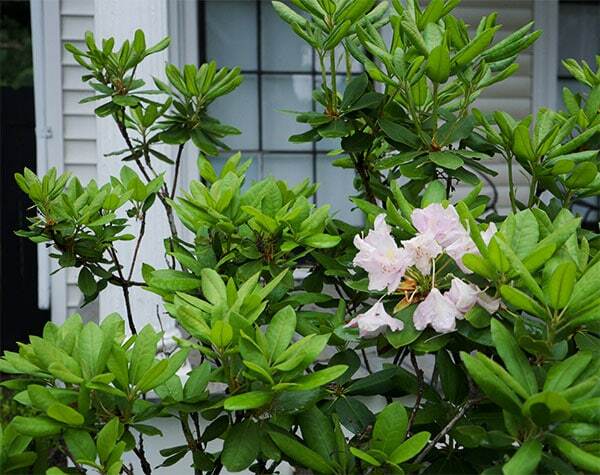 Our neighbor gifted us some azaleas that were originally planted in the 1940’s and they seem to be doing fine after planting them in our yard earlier this spring, so there may be hope yet for transplanting your rhododendrons. I love smokebush! I love iris! I love hosta! (Did I forget anything?) It all looks great and thriving and green and envy-worth. Good job, Daniel! I really hate gardening (like, please, give me any other house related task to do and I’ll do it happily – but gardening is the thing of my nightmares), but for three summers and counting, you’ve made me think that I have been missing my passion in life all along. Whenever I see your posts and read about your vision, I’m inspired. Since this is the third time it has happened, I now know that I will get out into my garden and hate life and wonder where my Daniel gene is. So this year I’ll live through your garden and appreciate the growth you’re seeing! I know you love black, but you should look into cocoa bark mulch for the front (non dog section of your yard). It darkens over time & turns a dark rich brown/black. It’s also super good for the soil. Funny timing. Just yesterday we had a garden designer over to give us some guidance on the lovely but overwhelming garden we inherited with our house. Front and center along the front porch are two very old rhododendrons. We dislike them for all the same reasons you dislike yours, and also felt guilty for wanting to remove such old, established plants. The garden person told us they would always be too leggy to be attractive there, and if it were her garden she’d remove them. She also advised us to keep an old dogwood we had some mixed feelings about, so it’s not like she’s into just tearing everything out. Point is, you are a good person even if you want to take out the rhododendrons this year. Daniel, go buy yourself some zinnia seeds! They are super easy to grow and will bloom like crazy all summer. They should reseed themselves next year, too. Se ve precioso! Se le dan bien las acidófilas! That smoke bush is DIVINE. I have major apartment-dweller garden envy. Looks great! If you DO plant blueberries (and the foliage is gorgeous), you really have to pay attention to the pH of the soil. Supplementing is easy, but without the right pH and plenty of water when establishing, nada. I planted some next to my raspberries and it took a lot of learning…..
Can see the hosta hedge looking really good in the future, such a good idea, especially when they are practically free. Enjoy your flowers, they are all so pretty in their own ways. Are you planning any roses for your garden? 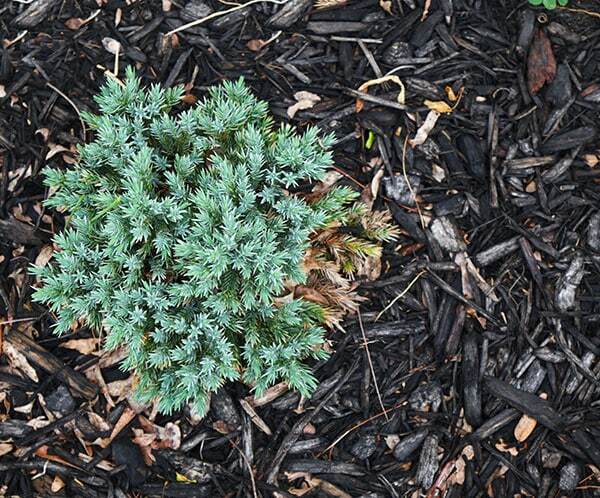 You have some beautiful, classic East Coast plants. But I confess I cannot get a sense of the garden, how it all looks together. Maybe the Lowe’s post will bring me that gift;). I second Lisa’s comments. I’d love to see some wider shots. I recommend Lungwort. You will love it, it’s a green leaf with white spots that propagates itself. Also, when gardening and filling things in, think leaf texture. Oh, and coreopsis, she’s a winner, winner chicken dinner. Thanks for that wegelia photo! My sister’s Rose of Sharon did not make it through the winter (Yay; not a fan), so I was looking for a replacement. Purchased; to plant Monday. I am equally lazy about watering but capitulated today because we have been unusually dry here in Western New York. I know that you are unhappy about the lack of attention paid Bluestone Cottage, but I’d bet those raised boxes in the front have filled in a bit. There IS that…. Prune the crap out of the rhodedendron. They love it. This was such a lovely read! For some reason reading about plants (which I have never done before) was really nice and calming and dang I feel all zen now and want to wander in a big garden of my own plants! I think you’ve inspired me to start digging in my own garden. Very excited for you Daniel! AND THOSE TREES. WOW. Nothing beats big trees along the street. They will look seriously amazing in a few years. yay! I love that you love your garden, Daniel! That’s really my dream: very small house, very big garden. 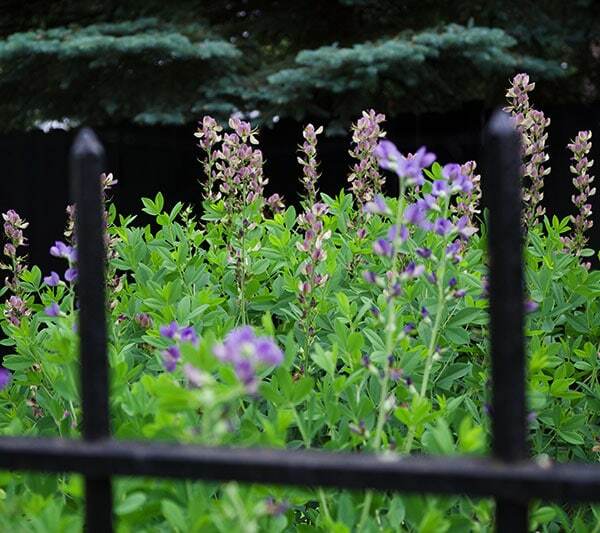 Thanks for the false indigo plant ID — we’ve got tons and I’ve been wondering what it was called! It looks great. I’m really happy you decided to incorporate some native plants in there! Just a tip for the oak leaf hydrangeas – they bloom from old wood, so don’t prune them to the ground like you would with Asian hydrangea varieties. If you prune them back every year they’ll never flower. I have a few in my garden, and it took about 3 years for all of them to bloom. I basically do no pruning and they produce huge blooms every summer. Looking good! 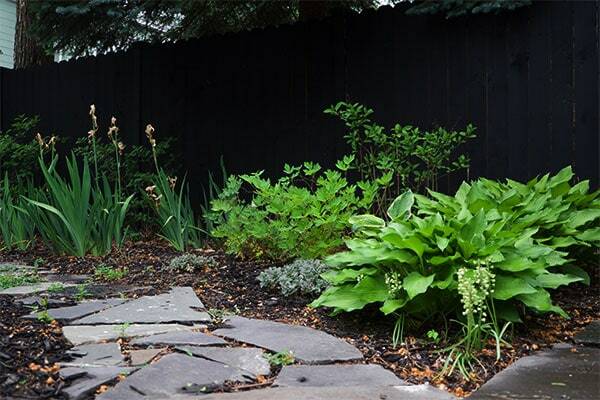 Consider putting heuchera in between the hostas – it’s similarly low-maintenance and will give you some variety. I love how everything is coming along! I have to say though, I second the mention about keeping an eye out for trouble with the pear trees. They are really common in landscaping in my area because of their fast growth and pretty blossoms, but that fast growth does lead to weaker trees and a higher chance of splitting, broken branches, whole trees downed during storms or high winds. And yes, those beautiful blossoms reek to high heaven. It is like a rotten fish, composty, mold, death smell. But all that aside, it looks lovely. 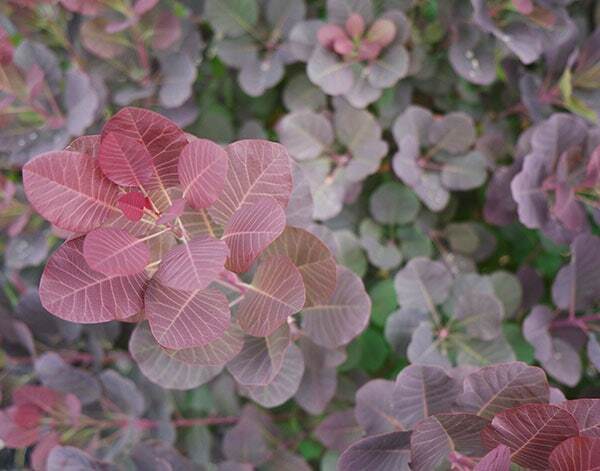 I’m filling away the smoke bush and purple sandcherry for future reference when I have a yard someday. I too am a big fan of having a variety of colors in my foliage. 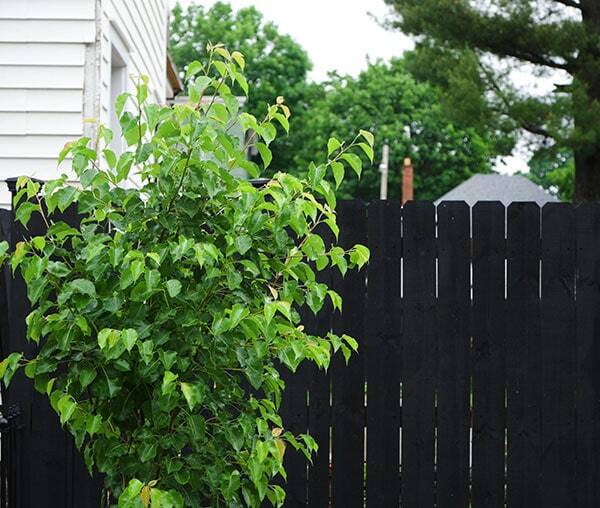 ← My Lowe’s Spring Makeover: Alex and Apryl’s Backyard!